Remember that kid in school who everyone hated because he refused to recite the pledge of allegiance? Hand over heart, we'd glare at the treasonous scum for his lack of love for 'Murica. What is he? Some kind of commie? Some kind of fascist? Well, it turns out that it's the Pledge itself that's fascist. It's Nazi-esque. 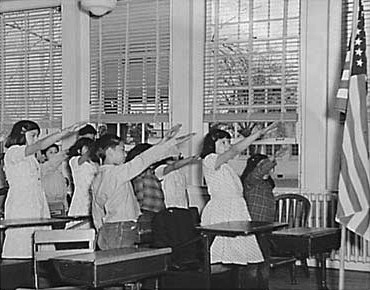 In fact, the "Bellamy salute" was adopted by the Nazis about forty years after children all over American were already doing it every day. The US waited nine years after the Nazis took power in Germany before finally deciding, "oh, we should change that," and went with the hand-over-heart gesture in 1942. Short, sweet, and to the point. Even a kid could memorize it, although they probably won't understand it. "My Flag," was changed to "the Flag of the United States of America," in the 1920s due to the large number foreign-born children in American schools. As you'll notice, the original Pledge also did not include the words "under God," which were added in 1954 to separate ourselves from those godless Soviets. 'Murica! But why did Bellamy write the pledge? Well, among other things, to sell flags. Seriously. Bellamy was chairman of a committee of state superintendents of education in the National Education Association. 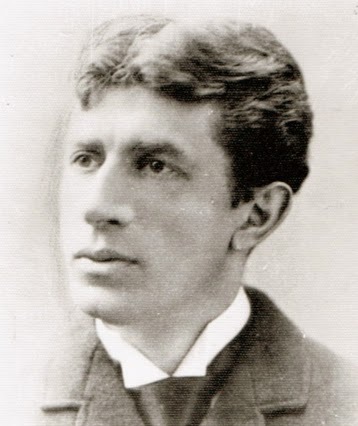 However, he was hired by The Youth's Companion, a popular children's magazine, to write the pledge to be featured as part of a national ad campaign conceived and promoted by James B. Upham to coincide with the 1892 Chicago World's Fair celebration of the 400th anniversary of Christopher Columbus' arrival in the Americas. The point of the campaign was to instill American nationalism pride in the children and sell flags to public schools through them. After being put in charge of the flag-selling, Bellamy found himself with Upham lobbying for the support of everyone from superintendents of education in all the states to the President himself. Anyone can see why a politician would endorse a program that seeks to manipulate the minds of children into empty shells of nationalism promote unity and American ideals through education. Obviously, Bellamy's and Upham's efforts paid off and they won the support of Congress, the National Education Association, and President Harrison himself. The President, as part of the celebration of the newly-declared Columbus day, issued a proclamation mandating a program created by The Youth's Companion that included the raising of the flag and the recitation of the Pledge in every public school. And they sold a lot of flags. But the whole concept of a pledge is anti-American, and when I say "American," I mean in the individualist and anti-authoritarian sense, not the 'Murica! sense. First, the concept of "pledging allegiance," is completely feudal - like a muddy and landless peasant or serf "swearing allegiance" to a lord or king up on his throne. The word "allegiance" brings to mind the word "liege," and specifically implies obedience, loyalty, and servitude. So when you recite the Pledge, you're promising your loyalty to the U.S. government as a matter of course. There's not even a qualifier for that loyalty in the Pledge. There's no "as long as the government remains faithful to the Constitution" or "unless the government becomes tyrannical," just simple, blind devotion no matter how bad that same government might abuse you. That doesn't sound individualistic or anti-authoritarian to me. Even if you still believe that we're a legitimate Republic (which I do not) and that the government serves the people and not the other way around, it should be obvious why you shouldn't recite the Pledge. Who should be pledging to who? Us to the government, or the government to us? Moreover, parts of the pledge are just plain lies. "One nation, indivisible?" The United States was originally created so that the states would almost be separate countries, the people in which would be free to decide for themselves on any issue or power that wasn't specifically given to the federal government in the Constitution. The federal government was relegated to national defense, representing the states in foreign affairs, and settling disputes between the states themselves. The federal government wasn't even allowed to directly tax citizens like they do to us now. As a people, I think we're extremely divisible. Look at Ferguson and all the recent race-baiting and Islamophobia in mainstream and social media. The only reason we might be considered "indivisible" is because our government can, has, and will use violent force to keep us that way. Is it "justice and liberty for all," or just the really powerful and well-connected? The court system can't even be called a "justice" system. Its only aim is to push plea deals and churn out convictions. That's easier when the accused has no powerful friends and no money. And... Liberty? Huh? What's that? You mean like doing drugs? Or offensive speech? No sir. Not in my back yard. But Bellamy didn't write the Pledge to celebrate the individualism and anti-authoritarianism from which America was birthed, as should be obvious - he wrote it in criticism of those very things. He despised free markets, individualism, and the lack of patriotic fervor in the 1890s. He was a leader in three "progressive" movements: Christian socialism, expansion of public "education," and the nationalist movement. Obviously Bellamy believed that reform through national government was the key to his personal utopia. However, to get enough support (or passivity) for this extensive reformation, it is necessary to make the population dependent on and blindly loyal to the national government instead of the state government or whatever foreign country that specific person may have come from. What better way to change the way a country thinks than to shape the minds of the children through the compulsory, government-provided schools? His hope for the pledge was to create a whole spectacle to cultivate within the children reverence for and submission to the federal government, and for the children to bring those ideas home. In other words, he believed in using public schools to push an agenda - making little boys and girls into ignorant, "patriotic" little soldiers of "democracy" blindly loyal to a government that abuses them daily - something that continues to this day. So the next time you're asked to stand for the Pledge of Allegiance, just relax and stay seated. If you're non-confrontational or just trying to blend in, mouth the words. But whatever you do, don't offer your blind allegiance to a bunch of thugs. I am glad I found this place. Thanks for perfectly writing my opinion of the pledge of allegiance. I think you could have improved this article by saying how it isn't wholly voluntary. I believe this way because school children 1: Begin reciting the pledge from a very young age (which I would call indoctrination!) 2: Students are not told of their legal right to not stand during the pledge and 3: If a student should refuse to stand during the pledge, they can be called names and even physically bullied. Overall, I would say the pledge should be abolished entirely. This is because it serves no real purpose to the education of students, or the benefit of the nation. To the author: I thought you'd like to know your commentary has seriously damaged the decades of carefully implemented brain-washing and indoctrination from the US government which I've lived by during the past sixty eight years; the end result being "almost" impenetrable cognitive dissonance!! Therefore, I had to check the validity of your facts which were available in www.ask.com. At the moment, I can honestly say: I don't know yet if I'll stand, or remain seated during the pledge of allegiance to our Flag in the future; "old habits" are hard to break after decades of "mindless obedience" to a national activity that smacks of absolute patriotism... right? So, thank you for "new" information now that I understand repeating that pledge is actually stating my allegiance to this government! "The duty of a patriot is to protect his country from its GOVERNMENT!" ~Thomas Paine, Revolutionist and Founding Father.